The Australia Council's Digital Culture initiative supports artistic projects exploring new concepts of liveness, connectivity and participation made possible with digital media. Artists in the digital era are expanding possibilities for our engagement with the arts and culture through emerging technologies. In digital spaces artists transform live experience and participation for audiences and users. Through new ways of collaborating across technology, artists are building and sharing creative knowledge and culture across broader networks. This is a general call for contributions to Dancecult: Journal of Electronic Dance Music Culture. Entering a new era with a new and expanded editorial and production team, Dancecult is extending its deadline on submissions for its next edition. New deadline - December 20, 2010. As the issue is hosting a special section on The Love Parade, submissions on this theme will be welcome, in both From the Floor and Feature article categories. New Matilda is an online publication covering politics, social justice, environment and offering critical thought in the Australian media landscape. They closed their doors earlier in the year due to lack of financial support, but have recently started up again. This time they're hoping for some support by readers - crowdfunding to help them keep publishing. Visit the New Matilda call for support page or go straight to the fundbreak page & make a donation if you can, to show your support. Let's help keep independent publications on-air & keep the conversations going. Videoctober is a collection of experimental audiovisual art. The aim of the program is to give an accurate sample of contemporary videoculture while stressing the all-time significance and power of imagination. On the 23 October 2007 Kelesau Naan, the Headman of the Penan village, Long Kerong, left his wife at a rest area in the forest to check on his traps. He never returned. Two months later his remains were found scattered across the Segita River, deep in the Ulu Baram, Sarawak. Presented by his son, Nick Kelesau, The Headman explores the events leading up to his disappearance. Kelesau Naan sought only to protect his people and their native customary right to the land they have lived in for centuries. His struggles may well had been his peril, but as Nick and his fellow Penan explain, his legacy endures. Sarawak Gone is an open licensed micro-docs series raising awareness to the persistent decline of indigenous life and culture in Sarawak, Malaysia. The series is produced and directed by the Australian media artist and musician, Andrew Garton, agarton.org, in collaboration with Sarawak Access (SACCESS). Beyond Zero Emissions was established in 2006 out of a concern that the stated climate change goals of other environmental organisations at the time contradicted the scientific literature. Policies these organisations were calling for if realised would see atmospheric greenhouse gas concentrations continue to rise, thereby causing devastation from global warming. The Australia Council's Digital Culture Fund initiative supports artistic projects exploring liveness, connectivity and participation made possible with new digital platforms. This is an exciting Australia Council initiative open to artists from all artforms, so please promote to your networks. ¬∑ Inventive strategies for live collaboration, presentation and distribution of artwork. This year OzQuest is running its fourth international program which will provide participants with the opportunity to design + assist in the construction of work in different Nepalese communities. David Anderson will be presenting the week‚Äôs additional public lecture. In this presentation, students will be inspired and see how they might have an opportunity to use their skills to participate in an expedition and be able to work alongside local tradesmen and Nepalese Architecture students to construct a facility for a small village in Nepal, be exposed to world heritage architecture and the people and culture of Nepal. 'Outside the Circle' will explore the development and growth of sound cultures that began life outside of commercial and mainstream circles. The conference aims to provide a forum for discussions concerning collections, recordings, research and technology based on alternative perspectives and paradigms. We hope to learn more about the individuals and groups working on the ‚Äòoutside‚Äô as well as their unusual uses of recorded sound. How is material generated from these alternative sources collected, preserved and accessed? What impact might this have on curatorial policy? Kaldor Public Art Projects are currently seeking submissions from sound artists and musicians for a free, digital compilation to be released later this year. 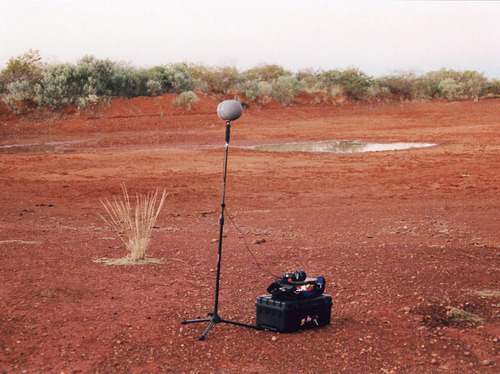 The compilation is aimed at framing Stephen Vitiello‚Äôs work from ‚ÄòThe Sound Of Red Earth‚Äò in a wider context, one that seeks to explore the prevalent themes of isolation, remoteness, distance, nature, environment and ‚Äòearth‚Äô through sound and music. A self-guided cycling tour is being held each Saturday during Sydney Design 2010 to showcase the creativity buzzing within the 2010 postcode. Unleash the photographer within and capture a slice of Sydney on this cycling tour with a difference. Exploring the design precinct and some of the lesser-known parts of Surry Hills, participants are provide with a LOMO camera, map and passport to aid in their self-guided tour, documenting discoveries as they go along. The cycling tour starts and ends at cloth and Metalab, meeting in the middle at I Ran The Wrong Way. These three venues will be showcasing the Designer Sushi exhibition - an exciting new project which challenges designers to re-imagine everyday objects. Edition 1.2 of Dancecult: Journal of Electronic Dance Music Culture now published. Transitory Life is a solo retrospective performance by Laurie Anderson drawing on her life‚Äôs work. The collection of songs and stories includes pieces from Anderson‚Äôs acclaimed solo shows The Speed of Darkness, Happiness, The End of the Moon and Homeland. I received a last min ticket from @artsdigitalera (tx!) so didn't arrive until about 10pm. rob hall was playing. I liked his set - thought it was quite varied, so there was something for everyone. it seemed to be a mixed, older crowd so I liked that too. I thought he was playing tracks going backwards in time. dubstep -> tech -> breakbeat -> acid house etc so I liked that too. went downstairs to the side of the stage to hear Autechre. I found myself standing, swaying more like it, in the spot where all the speaker air aligned and it was sending electric shocks through my arms, legs and face - cheeks & nose. lips were vibrating. base of my throat was constricting - I could feel this when I moved to other places, but not the feelings in the rest of my body. I could feel puffs of air going up my jeans and jumper sleeves, and with every beat of the heavy bass it was giving me a shock. it felt like a tens machine had been hooked up to the line out and was sending pulses into the floor & conducting through my shoes with every beat. I showed a few other people the spot and they felt it too. one girl told me it sounded better up the front, in front of the speaker, but that was too loud so I moved back to the other spot where it was less loud (if that's possible). at times it made me feel a bit sick. my nose was running. I had to keep moving away, but I had to keep moving back too. it was the most physiological reaction to a music performance I'd ever felt at a gig (& prob in my life, let alone at a gig) I was thinking that some of those frequencies must be borderline legal?? my friend's dave & murray mentioned there was a band that plays tones/frequencies that cause adverse bodily functions. I just kept thinking of an old Get Smart episode where they'd played tones to blow up or interrogate one of the russian spies - or something like that, I forget the actual details, but I remember seeing an old ep like that when I was a child and wondering how sound could do that. http://blip.tv/file/3686967 has a video taken throughout the night. ~ 1min of rob hall & ~ 5mins of autechre. it's from my phone cam so not the best quality, and autechre played in the dark, except for the lights of the bar, which I filmed to get some focus. it seemed to me like they were doing a southern cross constellation tour - playing under the constellation glow of the apple logos and desk monitor lights. from the side I could faintly see one of the guys from the glow of light from his mac book pro. so, for a performance I didn't think I'd get to see as I hadn't pre-planned getting a ticket, it was a great night - a very physical performance/experience for me. I slept & dreamt so well afterwards too. I had hoped to make it to Graham St John's book launch in st peters though I missed that. there were so many things on last night - it was one of those nights with too much choice so I almost stayed home, except for the ticket offer that made me leave the house.